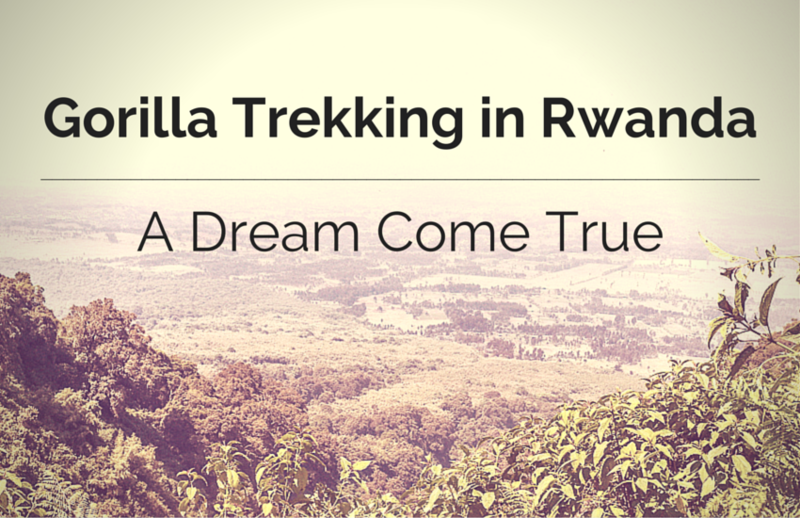 Ever since I watched Gorillas in the Mist as a teenager I dreamt of going gorilla trekking. Coming face to face with the gorillas was something that fascinated me and filled me with anticipation. If someone told me that I could only ever go on one trip during my life I would without a doubt nominate gorilla trekking in Africa. While living in Australia I had researched trips to Africa a number of times, however it always seemed out of reach, too expensive. When I moved to Germany I made a pact with myself that I would fulfil my dream before leaving since it was considerably closer to Africa. After having one trip to East Africa cancelled, due to lack of numbers, the following summer I managed to lock in a second trip. I spent a month camping around East Africa on an organised tour but the highlight was the very beginning of the trip. You can read more about my trips to Africa here, but stay with me for now, you’ll not be disappointed. I was going to see the gorillas! I was going to walk in the footsteps of the world-renowned gorilla conservationist, Dian Fossey. 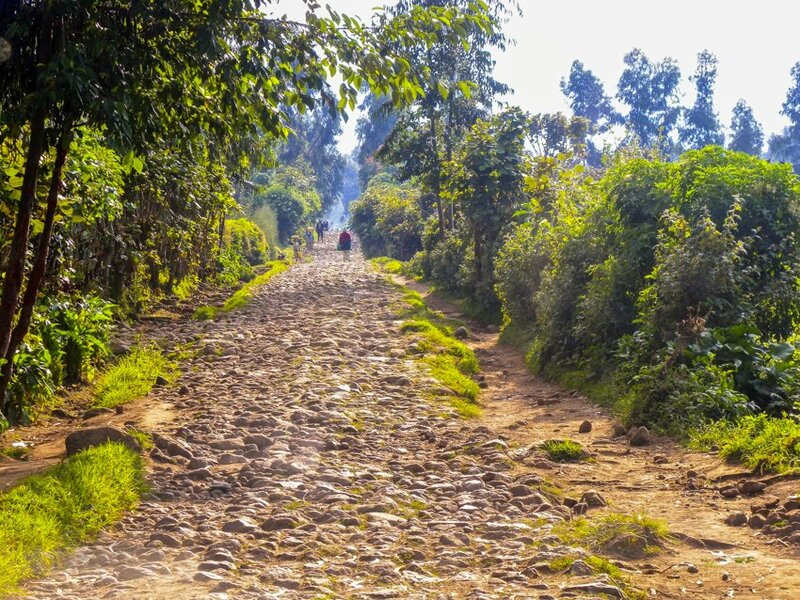 We started in Kigali, Rwanda, known as the land of a thousand hills. After an emotional day of visiting the Genocide Museum we got up at some ridiculous hour of the morning to make our way to Parc National des Volcans, Ruhengeri. 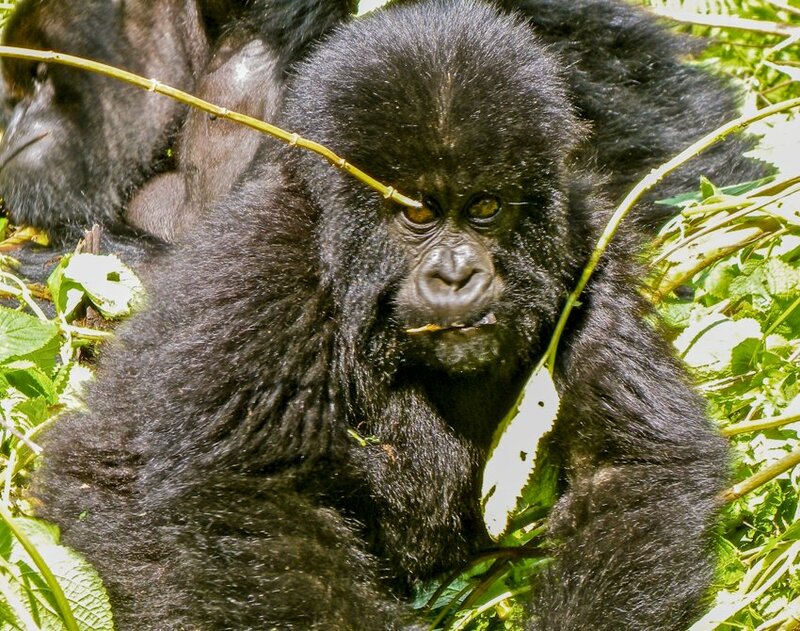 The national park borders two other parks in the Democratic Republic of Congo and Uganda and is where the endangered mountain gorilla is found. 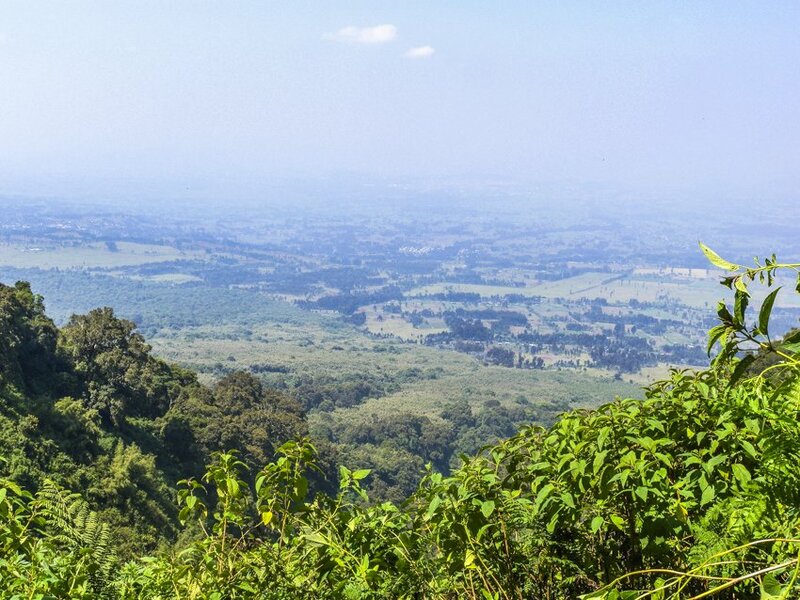 The area and its inhabitants has had a sordid history with civil war and unrest, poachers, disease, loss of habitat and local communities all threatening the existence of the mountain gorilla. These days the governments of all three countries are doing all they can to protect these beautiful cousins of the human race. A limited number of passes are granted to tourists each day to try and promote awareness but at the same time prevent over exposure to humans and their diseases. You must be accompanied by official park guides and trackers. We were greeted with a traditional welcome dance and then were broken up into small groups of about six people each and debriefed. 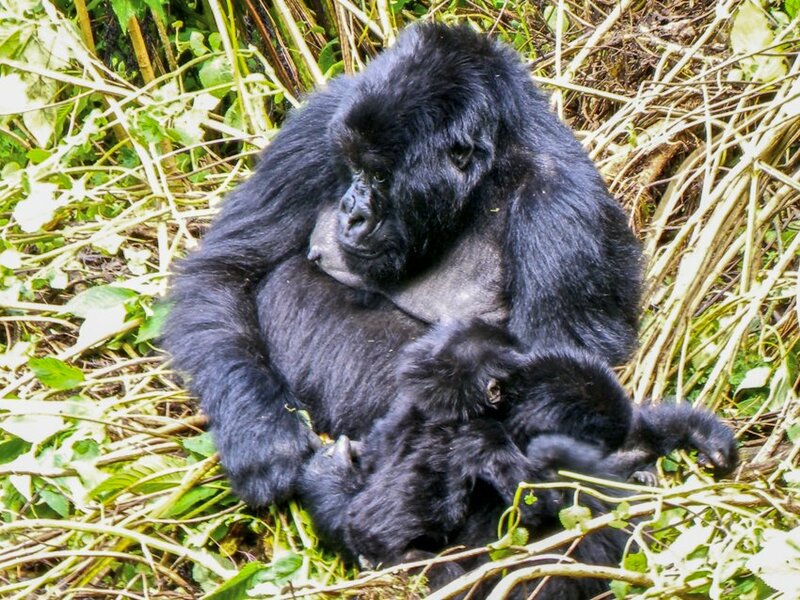 The hope was to find a particular family, there are around ten habituated families living in Parc National des Volcans, which consisted of some very young babies. We were told that there was never a guarantee that we would see the gorillas but it was highly likely. There was also no assurance of how long we would have to trek through the wild, untamed jungle to eventually find “our family” of gorillas. Would my life-long dream finally come true? Our group left the base camp with anticipation and excitement. First a short (thankfully) ride on the bumpiest road I have ever been on to the foot of the mountain and then began the steep ascent into the rainforest and bamboo jungle. It didn’t take long for us all to work up a sweat as we continued to climb up, up, up, along the macheted paths made by our guides. I was thankful that my newly acquired hiking boots were treating me well as we continued to climb through the thick untamed jungle. The trackers leave the hills at last light at dusk and then are up at the crack of dawn to try and find the families of mothers and their babies accompanied by the alpha-male silver back. They were constantly in contact with our guides and machine gun carrying “guard” (we were told it was in case the gorillas got aggressive but we knew it was more to protect us from poachers) . After well over an hour, maybe even two, we kept getting told, “5 more minutes, 5 more minutes”. Were we really going to have the privilege of coming face to face with these gentle giants? We soldiered on in the steamy heat of the jungle. No longer making our way up but now walking or should I say climbing across the mountain-side, clinging to anything that would hold our weight. At one point I stabbed my walking stick into what I thought was solid ground only to find that I was walking on tangled roots of the surrounding trees and plants. I have to admit this was when I had a mini freak out in my head and maybe a little out loud as well. Luckily our guides were experts in dealing with woosy Mzungus (Swahili for white people) and agilely helped me across the mountain while I attempted to cling to anything that seemed cemented to the mountain. And then suddenly out of nowhere, without warning, we stumbled upon “our gorilla family” basking in the morning sun! The three hours of trekking through jungle, bamboo forests, mud and across death-defying paths were worth every second of pain, sweat and mental anguish. 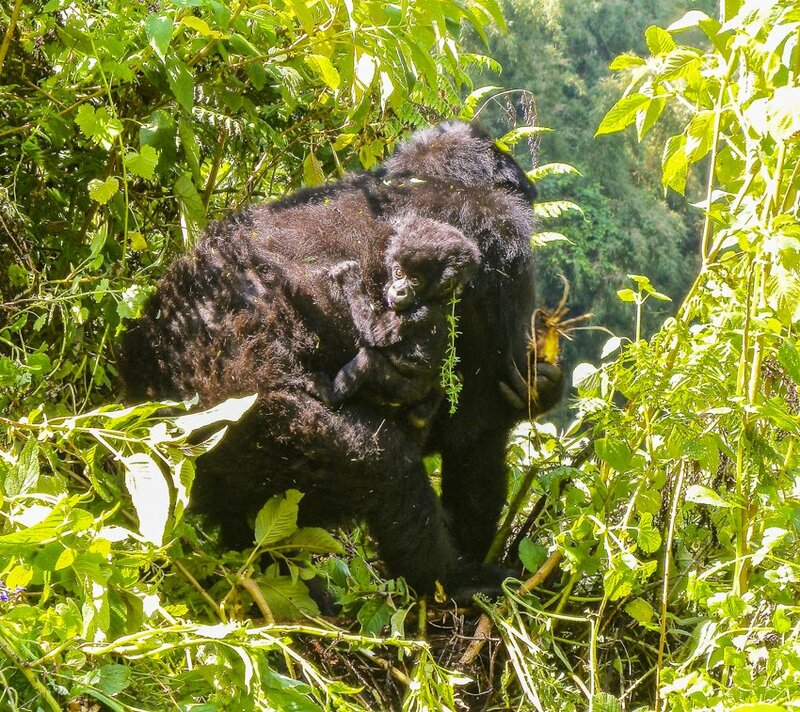 There in a bowl-like ditch of lush, green vegetation, almost made for gorilla viewing, sat “our gorilla family”. There were sleepy mothers keeping an eye on their playful, cheeky babies, allowing them to clamber all over their strong muscular bodies while they tried to catch a few moments of respite just like any mother. While the kids scrambled over their mothers and through the luscious grass, playfully wrestling with each other, the grand silverback lay unobtrusively to the side. His presence was felt but not aggressive. Even though he appeared to be asleep you got the impression that he knew every move that each member of his family made. 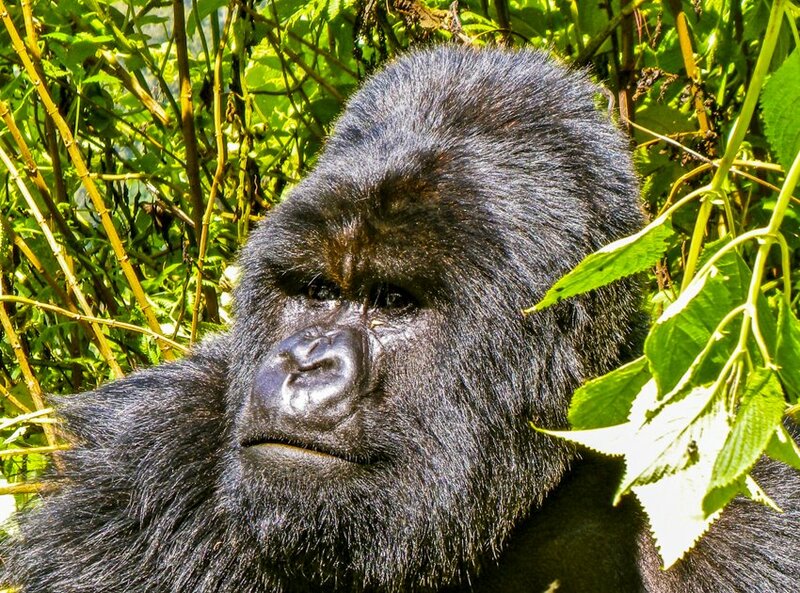 We sat on the ridge of the bowl, mere metres away, continuously snapping our cameras, mesmerised by the characteristics and mannerisms of the gorillas. Entertained by the brash, inquisitive youngsters who were so curious that they kept climbing the gentle sloping sides of the basin that their family lay in. Our guide had to keep making gorilla-like grunts to warn off the courageous little rascals. 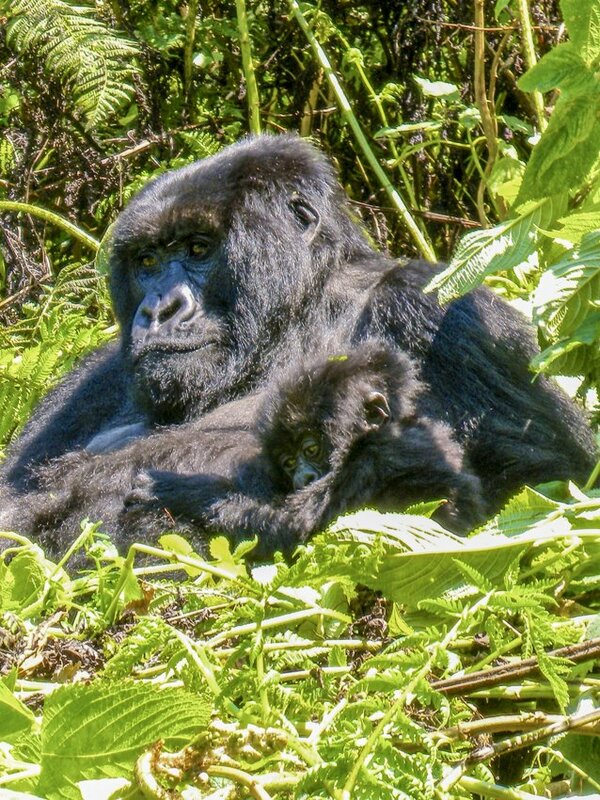 This was not because the baby gorillas would hurt us but because their mothers, or worse the big guy, could become protective and get aggressive. Gorillas are not generally combative unless they feel like their family is threatened. Not once did I feel unsafe during this phenomenal experience. Out of nowhere strolled a mother with near new-born twins clinging to her back. As quickly and soundlessly as she came into our view, she was gone again, disappearing into the tall vegetation. It got to a point where I put down my camera and just watched. Still. Not wanting to disturb their natural habitat. I was in awe of what I saw. Their human-like behaviour was fascinating and no words can truly describe how it made me feel. My dream had come true. The allowed one hour visiting time flew by, so much so that I thought we had only been there for about fifteen minutes and that the guides were trying to deprive us of our valuable time with these captivating creatures. We quietly crept away thankful to learn that our trip down was only going to be two hours and was more direct and less hair-raising than our ascent. So off the six of us went, forever thankful that we were lucky enough to spend an hour with the mountain gorillas of Rwanda. 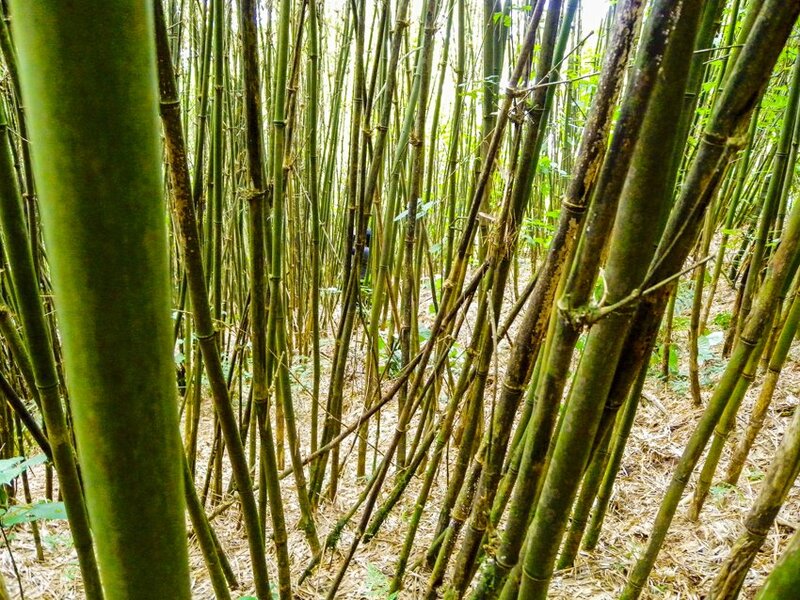 We stumbled down the mountain through the tall bamboo trees tired and craving a shower but at the same time satisfied and blown away by the whole experience. 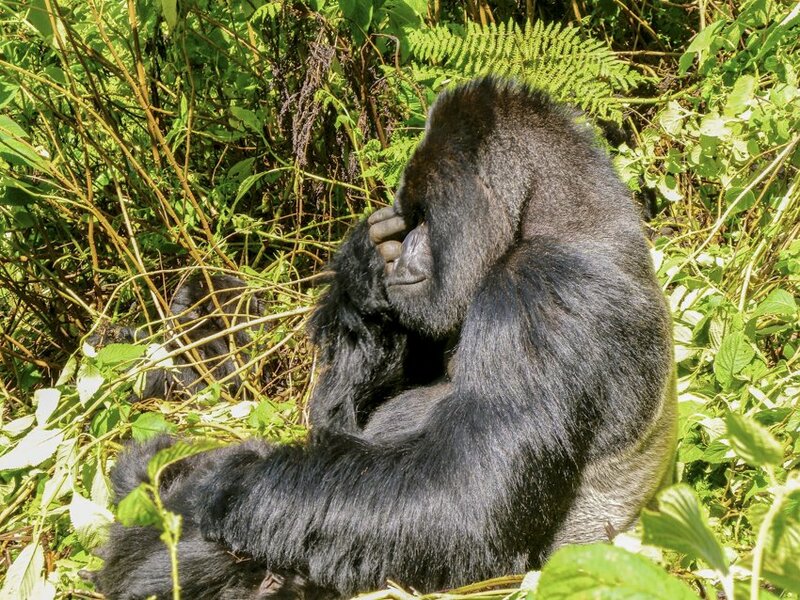 Once we got back to our hotel we swapped stories with the other groups only to find that they had each only hiked about half an hour to find a family of gorillas. I think deep down the six of us felt that our experience was extra special because it had been a little more challenging to find our group. I only wish David could have seen that. I did this trip before meeting Him, I wish we could have experienced it together. Oh well, guess we’ll have to go visit the gorillas again! 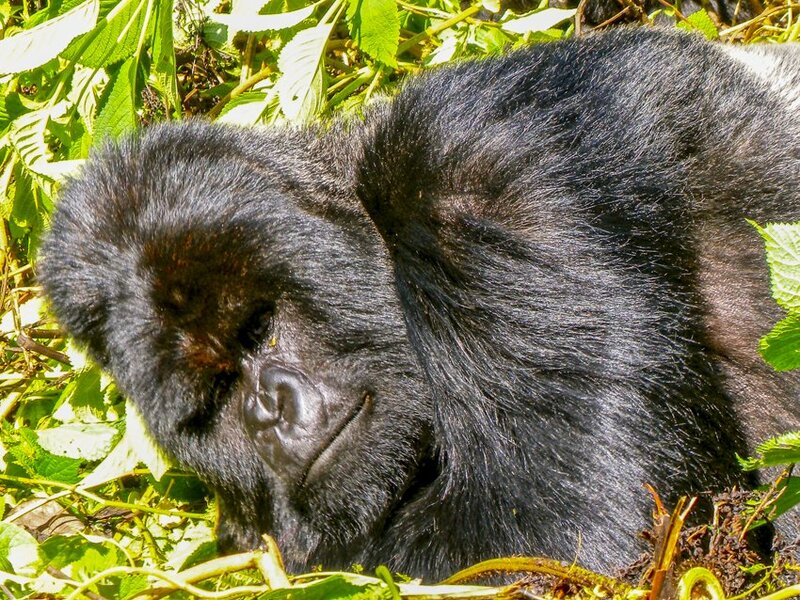 If you are contemplating going gorilla trekking all I will say is, save every penny and do it! It will be worth every cent. 2 Comments on “Gorilla trekking in Rwanda, a Dream Come True”. Join the Conversation Here! Beautiful images! Visiting these gentle giants in the jungles of Rwanda easily sits near the top of my travel experiences sofar in life! 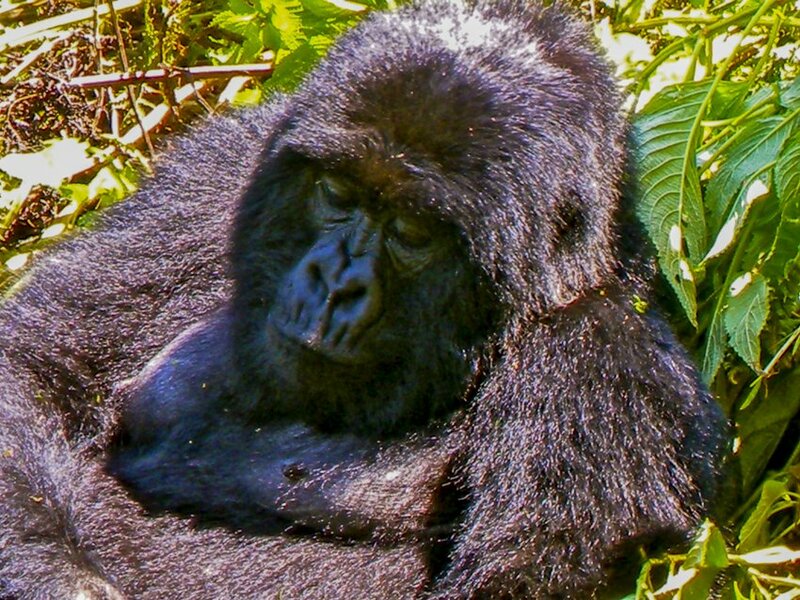 Silverback gorilla trekking is truly an experience that people need to have! I hope to go back the next time I’m in central Africa! Thanks Patrick. I totally agree, I would definitely say it was my top experience to date! I too would love to go back with David so we can experience these gentle giants together. Hope you get there soon.